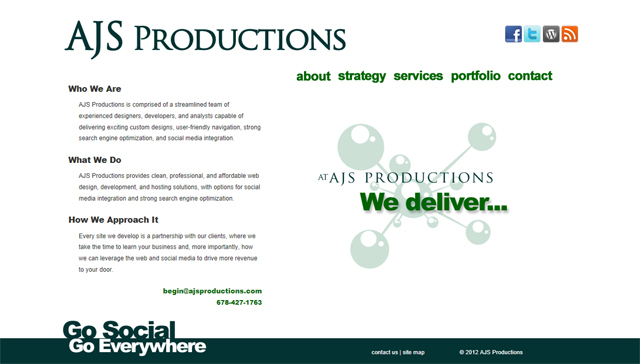 In April of 2011, with a few consulting engagements under our belt, we officially launched AJS Productions with a concerted focus on website development, social media integration and SEO marketing. The team’s background provides a full slate of skills on both technical and managerial fronts. Front office activities include project management, sales, business analysis, and production, while back office activities focus on programming, database architecture and administration, graphic design, content development and social media interconnectivity. The combination allows for the implementaion of the RAD approach, or Rapid Application Design, which keeps costs to our clients on a much more manageable scale. Yet the skills inherent to the team allow for a much grander approach. None of our clients are spoon-fed templatized sites with boilerplate layouts and content. We pride ourselves on implementing big-house development practices with small-to-medium business budgets in mind. From custom web design to search engine optimization and social media integration, AJS Productions gives our clients the very best of what the Internet has to offer. 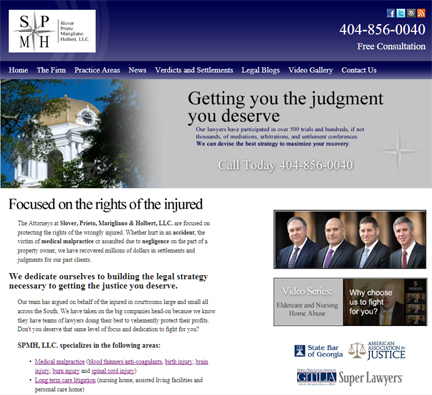 As we begin to look toward our one-year anniversary, we felt we were in need of upgrading our own web presence. Our clients have ranged from the professional office to the small start-up and from national associations to the world of musical entertainment. Our business strategy provides us a path, which allows us to collaborate with our clients — not just serve them blindly from afar. We spend time with them, getting to know their business and their needs, fostering a culture whereby we become partners toward mutual goals of growth and success. It is our belief that when our clients succeed and grow, so do we. In short, it is our belief that a satisfied customer is the best business strategy of all, and we wanted to showcase those wins with a new home. We would like to encourage you to take time and tour our site; learn our business model and our approach toward website design and development. Very few businesses today lack for a website. What we want you to ask yourself is, does the site you have truly reflect who you are and what you do? Is it current and relevent in this ever-changing, media-driven world? Are you leveraging the tools available to expand the reach of your sales and marketing? Are you proud to show it off, to see it emblazoned on every letterhead, business card, email closing, and brochure? Based on your honest assessment of where you are and what you have today, maybe it’s time to think about reaching out to the new name in web development and social media integration. Maybe it’s time to look for a partner who is as interested in your success as you are, rather than a business who thinks of you as just another work order number. We would love the opportunity to show you the possibilities.